1 Why Dogs Need Probiotics? 2 When to Give Your Dog Probiotics? 4 How to Select a Probiotic Supplement for Dogs? 6 Can I Give My Dog Probiotics Meant for Humans? Do you know 80% of your dog’s immune system is based in the gut? So administering a quality probiotic supplement will not only help to boost your dog’s immune system, but also help to treat recurrent digestive issues such as diarrhea, gas, etc. and reduce cholesterol levels. But before you start administering a probiotic supplement to your dog, you might come across a number of questions – How to select a probiotic for your dog? When is the best time to give? 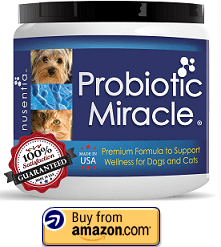 Can you give your dog a probiotic supplement which is meant for humans? 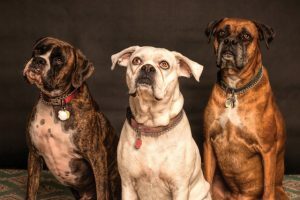 In this article we have answered all these questions and prepared a list of the best probiotic supplements for dogs that will help you to make an informed choice. Just like the human digestive system, a dog’s digestive system is home to billions of bacteria that maintain smooth functioning of their gut. But various factors such as infections, long term use of antibiotics or steroids, stress, old age or sudden changes in the diet can lead to imbalance of gut flora in your dog which can result in digestive issues such as diarrhea, gas, cramping, colitis, etc. A probiotic supplement can help to relieve diarrhea cause of stressful situations or excessive antibiotic use. Probiotics also improve the assimilation of vitamins and minerals from foods and aids your dog’s body to process critical nutrients such as vitamin B12. As stated before, 80% of a dog’s immune system is based in his gut. Different strains of probiotic cultures pair with different parts of the immune system and support its proper functioning which helps to reduce inflammation throughout the dog’s body and reduces his susceptibility to chronic diseases. It also helps to relieve yeast infections and yeast-related skin issues and improve the quality of the fur. The microbiome present in the gut is responsible for producing the neurotransmitters and neuropeptides that are required for maintaining healthy brain function. The intestine is filled with nerve cells that are connected to the neurones in the brain and probiotics can support the function of these nerve cells. Probiotics also support the synthesis of important hormones such as serotonin and help in DNA repair. No doubt the gut is called the second brain. When to Give Your Dog Probiotics? Although, people disagree on the frequency of giving probiotics for dogs, but it is safe to give a moderate potency probiotic supplement to your dog every day. Some experts say that dogs should be given probiotics only when they have digestive upset or when they are under stress or taking an antibiotic medication. You can give probiotics at different times of the day so that they will work differently depending on the situation in your dog’s GI tract at that time. Dr. Campbell-McBride recommends giving probiotic supplements between meals so that the microorganisms can avoid the harsh gastric juices and acids that are produced during digestion. How to Select a Probiotic Supplement for Dogs? It is best to choose a probiotic supplement tailored towards the health of dogs which ensures that the supplement includes the specific strains of bacteria mentioned above. It is important to consider the age of your dog while choosing a probiotic supplement because there is a significant difference between the nutritional needs of a puppy and that of an adult or aged dog. There is specific probiotic formula available for health conditions such a kidney disease, gastrointestinal disease, allergies or obesity which helps to address the health needs associated with these conditions. Dogs with specific food sensitivity such as dairy sensitivity should be given a non-dairy probiotic. Also, it is important to see that the supplement does not contain any harmful additives, fillers or carriers. If your dog is a picky eater then he might not be eager to chew on a tasteless probiotic supplement. There are probiotic supplements that are flavoured like regular foods such as chicken, bacon and beef which might excite your pet. Probiotics are living microorganisms which die off over time. So, it is best to choose a supplement that guarantees the potency and stability of the living cultures till the date of expiry, not just the date of manufacture. This is a reputed and well-established brand and highly favoured by vets. This supplement contains strain Enterococcus faecium SF68 along with a range of other nutrients such as vitamins C and E.
This supplement supports a dog’s digestive health and immune system in general. Being a powdered product that comes in individual sachets, this supplement is easy to administer. It can be sprinkled on your dog’s regular food once every day. This probiotic supplement is especially beneficial for dogs suffering from diarrhea. This supplement contains 7 different probiotic strains including Bifidobacterium bifidum, Enterococcus faecium, and Enterococcus thermophiles along with 2 prebiotics that ensures survival of the bacteria in the intestine. This supplement comes in paste and capsule form. The paste is a short term version of the supplement that can be administered for a few days to help treat diarrhea and the capsules can be administered on a daily basis to support general digestive health. Each capsule of this supplement provides 5 billion CFUs of live microorganisms. The capsules are blister packed to ensure viability and stability of the microorganisms. 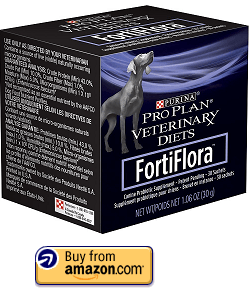 This is a high potency probiotic supplement powder for dogs that helps to relive diarrhea, gas and bad breath and helps to improve energy and quality of the fur. Each scoop of this powdered supplement contains 2 billion CFUs of beneficial microorganisms. This supplement includes 22 carefully selected probiotic species along with a digestive enzyme and pure prebiotic inulin. This supplement is made in a GMP certified facility and is free from sugar, grain maltodextrin, soy, wheat, fillers and artificial flavours. 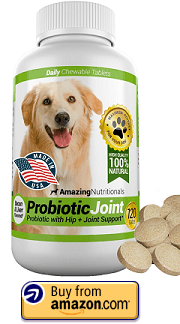 This is a specially formulated probiotic supplement for dogs that helps to improve joint health along with the digestive health. This supplement contains one of the well-researched strains – Lactobacillus Acidophilus along with calcium, glucosamine sulfate, chondroitin sulfate and digestive enzymes that supports digestion, maintains healthy joints and cartilage and improves skin and coat quality. Each serving of this supplement provides 7 billion CFUs of live microorganisms to the stomach. This supplement comes in easy-to-administer chewable form in delicious bacon and beef liver flavor that tastes great. This supplement is 100% natural. It contains no by-products or allergens which makes it suitable for dogs with food sensitivities. The manufacturer provides 100% money-back guarantee within 60 days of purchase. 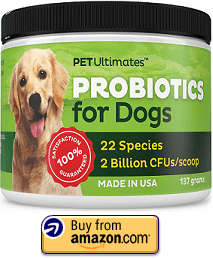 This is a 100% vegetarian and allergy sensitive probiotic formula for dogs that contains over 360 billion CFU per jar and 1 billion CFU per scoop. This supplement comes in tasteless powdered form and it can be easily sprinkled on regular dog food. This supplement is suitable for dogs with allergies and it can address a number of health conditions such as loose stool, constipation, diarrhea, bad breath, etc. This supplement contains 6 different strains of beneficial bacteria including B. animalis that has been proven to reduce the risk and duration of diarrhea in dogs. This is a GMP certified supplement free from sugar, soy, wheat, gluten, dairy, fillers, artificial flavourings and by-products. The manufacturer offers 100% money back guarantee within 60 days of purchase. Can I Give My Dog Probiotics Meant for Humans? There are no studies that have shown any harmful effect of human probiotic supplements on dogs. But veterinarians often recommend pet owners to opt for probiotic supplement specially designed for dogs because such supplements contain the specific strains of bacteria that are required in a dog’s gut. There is a significant different in the microbiota of dogs and humans along with differences in the acidity of digestive enzymes and stomach fluids so it is best to choose a probiotic supplement that is tested safe and effective for dogs. Probiotic supplements are generally considered safe for dogs and there are not many known serious side effects either. Most quality probiotic supplements are well researched with the safety of your pet in mind. In rare cases, side effects can happen but these are mostly allergic reaction and the symptoms include increased itching, swelling of the lips or tongue, or difficulty in the breathing. Some dogs may also encounter difficulty in walking steadily. But in most cases, such extremely reactions are seen in low-quality supplements or if the dog has an extremely weak immune system. Choosing a probiotic supplement from a trusted and reputable brand negates these risks and side-effects. Probiotics are essential not only to maintain overall health and well-being of your canine friend, but also addresses specific health issues such as digestive disorders, lowered immunity, lack of energy, etc. While there is a great range of products available in the market, it is best to select the one which ensure you get best value for your purchase. Also note that probiotic supplements are equally important to both men and women, too.